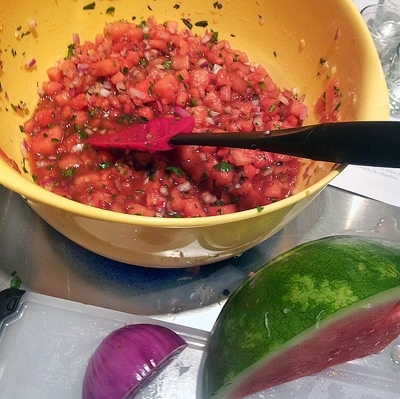 Read on for recipes using watermelon in an ice cream treat, salsa, sorbet and agua fresca. Get even more watermelon recipes from the official watermelon site! And enjoy summertime. LINE 2-quart bowl with plastic wrap, making sure wrap hangs over side of the bowl by at least 4 inches. SPOON sherbet into large mixer bowl; beat with mixer or stir with spoon until smooth. Spoon sherbet into prepared bowl, pressing into the bottom and up the side with the back of a spoon to form a smooth layer. Freeze for 30 minutes. Remove vanilla ice cream from freezer and allow to soften for 10 minutes; spoon into large mixer bowl and beat with mixer or stir with spoon until smooth. Add to bowl with sherbet, smoothing it over the sherbet in a thin layer. Freeze for 30 minutes. REMOVE sorbet from the freezer and allow to soften for 10 minutes. Spoon sorbet into large mixer bowl and beat with mixer or stir with spoon until smooth; stir in morsels. Spoon sorbet mixture over ice cream so it fills the remaining space and fills the bowl. Smooth down top; cover with plastic overhang, then add another sheet of plastic wrap. Freeze for at least 6 hours or up to 1 week. TO UNMOLD, remove plastic wrap from top of bowl. Gently tug at the plastic overhang to loosen the bombe from the bowl. (If the bombe is difficult to remove from the bowl, set it in a large bowl filled with warm water for 8 to 10 seconds.) Place a serving platter over the bowl, invert and shake to release bombe. Peel away plastic wrap, then cut bombe into wedges. Serve immediately. Combine all ingredients and stir. Adjust spices as needed. Serve at room temperature with tacos, fish, meats or vegetables.